WASHINGTON, DC (August 20, 2018) — McDermott+Consulting (McDermottPlus) is pleased to unveil the redesigned www.mcdermottplus.com. In addition to cosmetic updates, we have undertaken significant functional upgrades and thoughtful content reorganization. In order to facilitate a smooth transition, we thought we would preemptively answer some of your most pressing questions. Capabilities: Under this section you can find information on the services we offer and the industry sectors we currently service. Professionals: Meet our great team members. Resources: Your one-stop page for all resource information. From the Overview page, you can view all resource center updates and other information in a chronological newsfeed, or access a specific section. You can also click directly into a dedicated resource center from the menu. Information and Updates: This is where you can find any resource information that is not housed in a specific resource center. +Insights: Under this navigation item you will find original McDermottPlus analysis. Contact: Here you can find location information, subscribe to any of our newsletters, and get in touch. What happened to MACRA (and PAMA)? 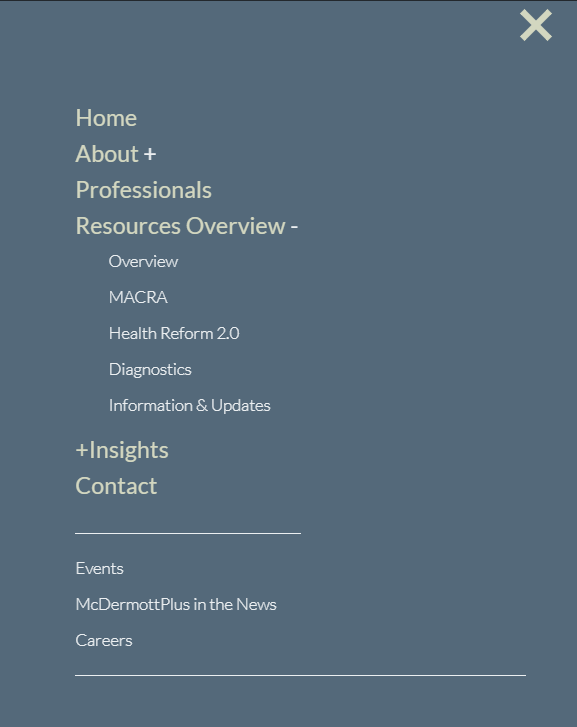 We have expanded the scope of both the MACRA and PAMA resource centers. Since the scope of payment transformation goes beyond the Medicare Access and CHIP Reauthorization Act (MACRA), so does our coverage. 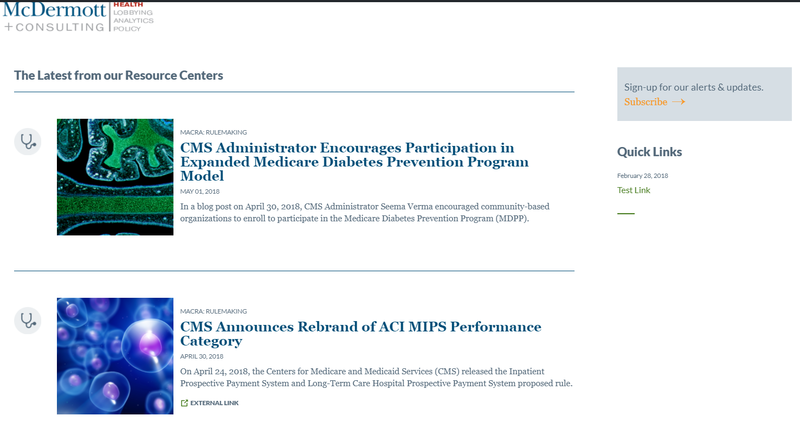 Here you will find a library of content specific to Medicare payment transformation initiatives, including original analysis, major regulations, agency guidance, program announcements and other primary source documents. With Section 216 of the Protecting Access to Medicare Act (PAMA) implementation in full effect, we have found it helpful to cover the diagnostics industry more broadly. Here you will find a collection of primary source materials about laboratory diagnostics regulation and payment, including original analysis, Medicare rates, rulemakings, final determinations and other items of interest. What else has changed in the resource centers? No more PDFs! All of our resource centers have been integrated into the website. You can navigate to a specific resource center via the homepage, menu or from the Resource Overview page. As you scroll down the page, posted items are available in a chronological newsfeed, with posts categorized and tagged. Users can click on categories or tags to filter results. What if I’m looking for something but can’t remember where or when I saw it? We’ve got you covered! We have expanded the search functionality and added tagging and filtering features so that you can easily search by keyword, both across the website and within a dedicated resource center. We hope our shiny new exterior better matches the quality of the content that we deliver to you. If you have any questions or comments, please contact Jennifer Randles. For more information about McDermottPlus, please visit www.mcdermottplus.com.